St. James African Methodist Episcopal Church is located on the northeast corner of Martin Luther King Boulevard and Court Street. The building was designed by John Welch in 1842 and completed in 1850. When it first opened, it was the High Street Presbyterian Church and was considered to be the society church of the neighborhood. Today's concern of the 2,000-member AME church is the private academy they are planning for the children of Newark and a variety of church-related activities. St. Nicholas Church at 553-59 High St. is a five-bay, two-story, nine-step building supported by a handsome portico with fluted columns. The front corner towers face High Street, and the crossing point is crowned by a Greek-style dome. Byzantine and Roman influences prevail throughout the building. On or near this location Cudjo Banquante, a former slave, lived following the American Revolutionary War. Banquante has been identified by researchers as one of Newark's first African-American 18th century businessmen. Directly across the street is the Whigham Funeral Home, founded in the 1940s by Charles Whigham, who was the guiding light of the 1960s establishment of City National Bank. At the intersection of High/King and William streets is St. Mary's Abbey, originally built in 1846 and looted by the Know Nothing Party in one of the 19th century anti-Catholic riots which took place in Newark and the rest of the country. Today, several impressive 19th century brick buildings make up St. Benedict's Academy which is one of the city's finest private schools one which draws many students from the African-American and Hispanic communities. The Newark School of Fine and Industrial Arts began in 1882, offering informal sketch classes for men. Within five years, the board of education took over its operation. The Evening Drawing School soon claimed 720 students and 13 instructors. Prominent local physician Dr. Edward Ill gave the property for the building in 1930. The art-deco design was the work of the Newark architectural firm of Guilbert and Betelle. The U-shaped, nine-bay facade is dominated by a dramatic central tower recently illuminated. Not only is the school an outstanding structural landmark, it is an educational jewel as well. The original structure is adjoined by a multi-million dollar recent addition. Together, they comprise the new Arts High School. The Newark School of Fine and Industrial Arts, which has been in danger of closing for the past year, has since moved to Lyons Avenue. Across South Orange and Springfield avenues is the large county parking lot at the edge of the Essex County governmental complex. To the east is the back door of the Cass Gilbert-designed Courthouse which opened in 1907. To the west is the massive Essex County Hall of Records, constructed of Indiana limestone with its three handsome bronze doors and steps leading down to the street level. Behind the building are the county court building and jail, and the parking deck. This cluster of buildings begins at the court house and runs west three blocks. It is as impressive as the capitol complex in Trenton or any of the county seats of New Jersey. Opposite the courthouse on West Market Street we pass the home of Essex County College, the mega-structure built in the 1970s as a self-contained, two-block facility to house more than 8,000 students and faculty members as one of the state's largest county colleges. The original campus has expanded to the west to include a gym, and, to the east, a computer center. The college cafeteria was once the site of the northeast's third-oldest black Episcopal church, St. Philip's, which subsequently merged into Trinity-St. Philip's Cathedral. The original structure was built in 1848 on land donated by Thomas Garwaith of Grace Church on Broad Street. As we cross Raymond Boulevard, remember that in the 19th century, the road below was the Morris Canal. In the 1930s the canal was drained and the Newark City Subway was built directly beneath the boulevard. The large parking building on the left was, until 1975, the site of the old Newark Slip Factory. A disastrous fire April 23, 1975, drew 14 of Newark's 22 engine companies into service. Within minutes, the adjoining Hahn's warehouse and the Metropolitan Furniture factory were ablaze, making this one of the city's worst fires in modern history. On the east side of High Street stands the last of the Prudential warehouses, now used by Rutgers-Newark. In the 1930s, it was a multi-service storage and printing facility. The gymnasium of Central High School stands where once a Hampton Court-like plaza opened onto rows of terraced steps. Across the street sits the citadel of buildings which is the heart of Rutgers-Newark, the largest of the city's college and university complexes. The impressive castle-like building on the western crest of the hill is the administrative building of the New Jersey Institute of Technology (NJIT), built as the Newark Orphan Asylum. 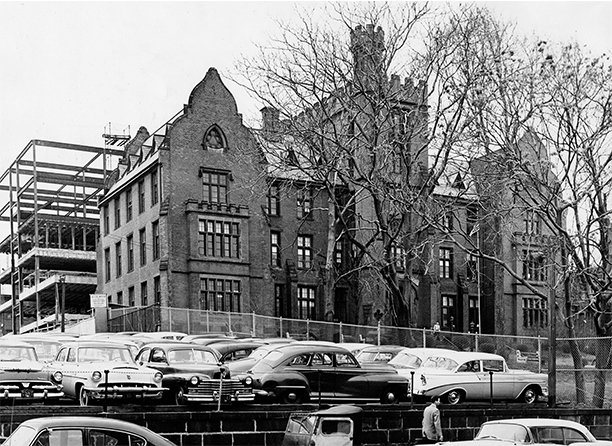 Today, it is known as Eberhardt Hall, named for the Newark College of Engineering/NJIT trustee largely responsible for its salvation and preservation. Architect John Welch designed the castle in 1857 in the Flemish-revival style. The six-story turreted building was paid for by public subscription and cost only $31,000. Crossing over Central Avenue is a row of sturdy townhouses built for 19th century middle-class Newarkers, now occupied by fraternities, sororities and a few individual owners. This great group of buildings needs some urban TLC to continue into the next century. They are well-designed, robust buildings, not too large, and ready for restoration and preservation. Across the street is St. Michael's Hospital, founded in 1867 by the Sisters of St. Mary's Hospital in Hoboken, added to in 1888, 1916 and 1952 and largely rebuilt in the 1990s. While the medical center now faces Central Avenue, the complex remains an important part of the High Street/King Boulevard history. Its medical fame rests not on its interesting Victorian facade, but in its work in heart surgery, alcoholism, infectious diseases, AIDS and strokes. As we pass under the New Jersey Transit Morris and Essex lines and Route 280, we see two great residential blocks. On the right was Columbus Homes, the state's largest low-rent housing units from 1954-96 when the last buildings were demolished. The eight large, 12-story towers were designed to accommodate 1,550 families. But on June 3, 1996, 440 pounds of well-placed explosives reduced the three remaining buildings to rubble. Across the street, along Clifton Avenue, the luxury Colonnade Park apartment complex was designed by famed architect Mies van der Rohe. It contains 1,240 spacious units. Like nearby St. Lucy's Church, they have survived the upheaval of the last three decades and hopefully look forward to a brighter future. From mansion to cottage, from luxury apartment to housing project, from house of worship, courthouse and hospital, High Street and King Boulevard help tell the story of our past through the architectural gems left in our trust. Look at this marvel. I think you will be impressed by what you see.